It’s time now to head north once more and visit our old Scandinavian friends the Vikings; here they are the theme of an online slot called The Vikings Wheels of Valhalla, it’s developed by Magnet gaming and it comes with several creative bonus features as well as a progressive jackpot. The Vikings Wheels of Valhalla is a five reel slot with three rows and eleven paylines – wins can be made in both directions though which effectively doubles that number. The reels spin on a decorated wooden structure which sits against a backdrop of trees, mountains and oddly blocky clouds. All the symbols are related to the theme and include a fish, a foaming mug of ale, a leg of ham, a sheep, a Viking helmet, a shield, a sword and Thor’s hammer – Mjolnir. 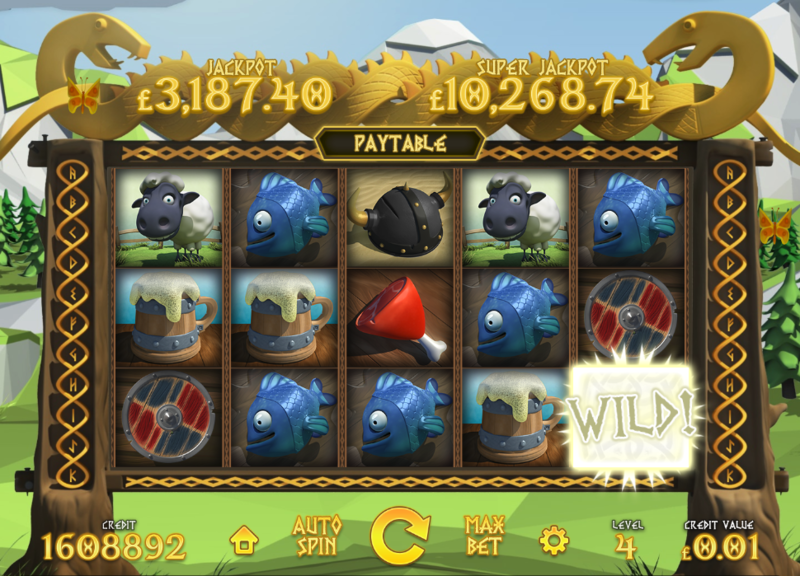 The wild is a big, glowing ‘Wild’ which will replace all others to help form winning combinations except for the bonus symbols – the longship, the gold coin and the woodsman. There’s also a second wild which appears on reels two and four and this will expand to fill all positions. Trigger this by landing just one gold coin on reel three; all the reel positions will now flip over to display question marks and all you have to do is select them for cash prizes until you find the red ‘X’ which ends the round. Finding all the coins before ‘X’ will take you to the Jackpot Flash round (explained below). This is triggered by landing two of the woodsman bonus symbols anywhere on reels two and four; you now have to guide three Vikings through a forest consisting of 56 tiles by clicking on the highlighted spaces to win money and to continue. Hitting three dangers will end the round but reaching the end will take you to the Jackpot Flash round. Trigger this by landing at least four of the longship bonus symbols anywhere in view and you will now get to follow the progress of the boat as it passes through various picking rounds including fog, barrels and fishing nets. A red ‘X’ will stop that particular picking session and your journey will continue until you battle the sea monster at the end. To do this just spin the single reel to reveal a tentacle (you lose a life), an axe (the monster loses a life), a heart (awards you an extra life) or a gold coin which awards a prize. If you win this battle the Super Jackpot Flash round is awarded; if the monster wins it’s just the Jackpot Flash. This is where the progressive jackpot values can be won and both are reached via the bonus features described above; you’ll see a screen displaying various prize clouds, two of which are the Jackpot and Super Jackpot. A bolt of lightning will remove all clouds except one and that’s your prize. The Vikings is one of a small number of slots beginning to blur the line between slots and video games and that’s a welcome move as far as we’re concerned, although there are purists who may think otherwise. This game is a lot of fun with plenty of bonus action to keep things interesting and some big wins available, especially during The Journey. It comes with an RTP of 96.50%.